Homemade Taco Sauce Recipe - It's practically the new ketchup! Today we’re sharing our homemade taco sauce recipe. It’s easy and it holds several advantages over store bought sauce. And if taco sauce is your thing, you might also want to check our our fish taco sauce recipe. Anyone else obsessed with taco sauce? We’ve started using it in quantities similar to our ketchup usage. It all began with taco night during which we found out our kids really like it. They started demanding it in large quantities. We like that they enjoy taco sauce and we’re hoping it leads to them liking more of our healthier chili and taco recipes. But anytime your kids start demanding food in high quantities you want to be sure you know what you are giving them. And the only way to be sure of that is by going homemade. So today we’re sharing a homemade taco sauce recipe. Read on for an ingredient list you’ll be able to pronounce (bye bye high fructose corn syrup). Our homemade taco sauce recipe is super easy to throw together. That’s important in a busy household when time is short and meal prep is a big challenge. But this is just a tomato puree base with water, white vinegar, honey or agave and then some our favorite spices. 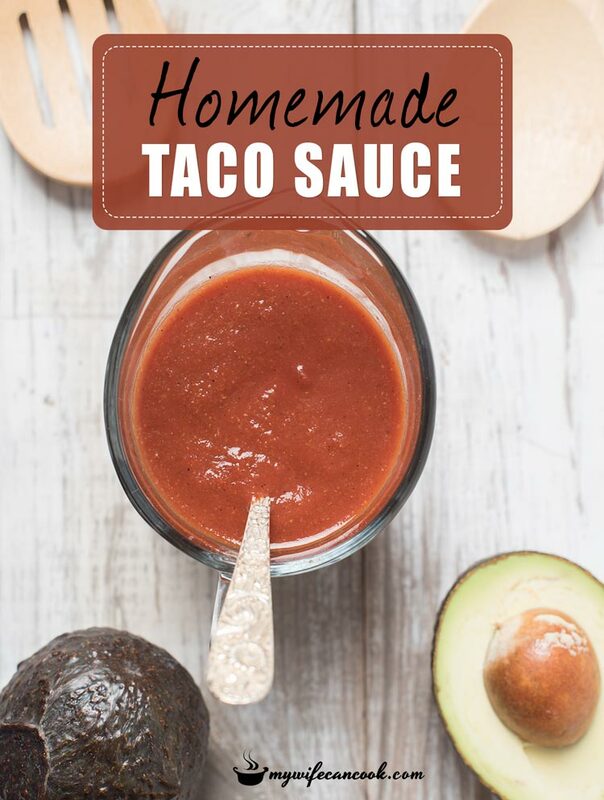 We tend to not go too spicy with our taco sauce because our kids are still slowly venturing into spicier foods, but that’s another great thing about making your own taco sauce. Your sauce, your way. Kick it up a notch or dial it back as needed. With fries as the new ketchup? No? Well then tell us your creative uses for taco sauce. Putting this homemade taco sauce recipe together is as easy as owning a whisk. Just whisk it! You could also just use a fork, of course. We tried a version where we heated on the stove and simmered to see if it enhanced the flavor. Fortunately, we didn’t see a difference. 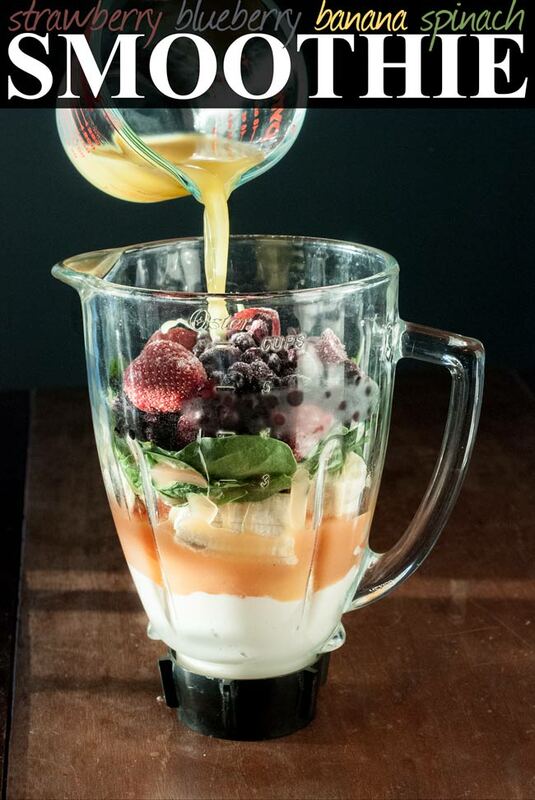 So, skip the extra step and just whisk it together and serve! We like to store the leftovers in a mason jar in the fridge and it should last for a couple of weeks–or make an extra large batch and freeze some of it. Enjoy! This is mild taco sauce, if looking for spicier, add your favorite hot sauce to your level of spiciness. Made the sauce todsy for vegan tacos.awesome will sure do it again.thanks for posting . You’re welcome! I’m so happy it worked out for you! We go through it quickly! 1 Tablespoon. 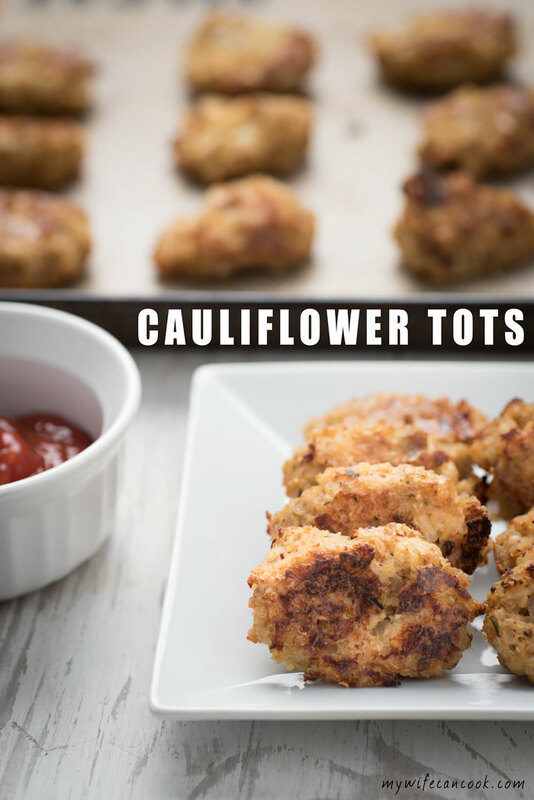 We have tried to update our recipes with Tbsp, but I have clearly I haven’t found all of them yet. Homemade sauces are best. We are having a Mexican themed dinner here for a birthday celebration this weekend. Tacos are on the list. Perhaps I should make some of this to go along with them. I’ve never made taco sauce before (and if I’m to admit it, I don’t think I’ve ever had it). We usually just put salsa on our tacos, but you’ve really intrigued me with this tangy, spiced blend and since tacos are a mainstay in our house, this will be a great change from our standard “Old El Paso”. Brilliant idea! Our kids weren’t into the “clumps” in salsa, so we resorted to taco sauce. The bottled kind has some strange ingredients in it, so we like the homemade version! I love a good homemade sauce! 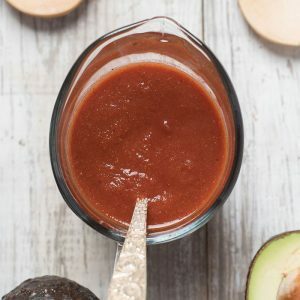 I’ll have to give this taco sauce recipe a try – usually I grab a jar because taco nights are our lazy nights but this sauce looks too good to not try! I’d definitely add hot sauce to mine. We definitely grab the jarred kind occassionally, but it is really easy to make! Homemade sauces are the bomb! I have a friend with a corn allergy, so I can wait to share this with him. He has so few options, and is always having to read the labels to avoid corn. Wonderful idea! Yeah, they put a lot of strange ingredients in the bottled kind. Better to make homemade if you have allergies! Um.. I’ve never heard of taco sauce before! Except for the taco bell packets hehe. I love this idea though– we’re big hot sauce fans, and this seems like a milder version. I want to put it on all the things!!! We can go through a lot of this sauce! I’m with you all the way on trying to find healthier options of everything. 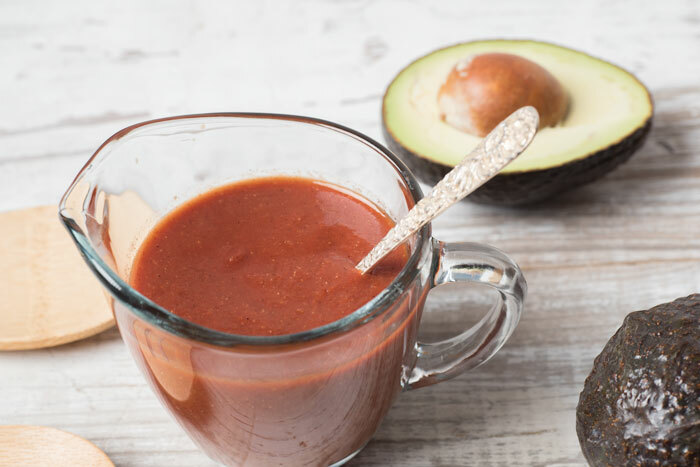 This is a great version of taco sauce….and I totally agree that it will go well on EVERYTHING. We love tacos and enchilada bowls and all similar things so this is going to be great. Thank you. You’re welcome! We definitely use it all the time! It doesn’t last long in our house! You can’t beat homemade sauces!! They just taste so much better and I can think of so many ways to use this taco sauce — and not just on the taco. Fish and chicken would benefit from the taste as well as pork. I’m making up a batch. You know, I’ve never made homemade taco sauce and it’s such a good idea! It sounds so simple to make and I love that it means that I can adjust the spices to my own (heat lightweight) tolerance. 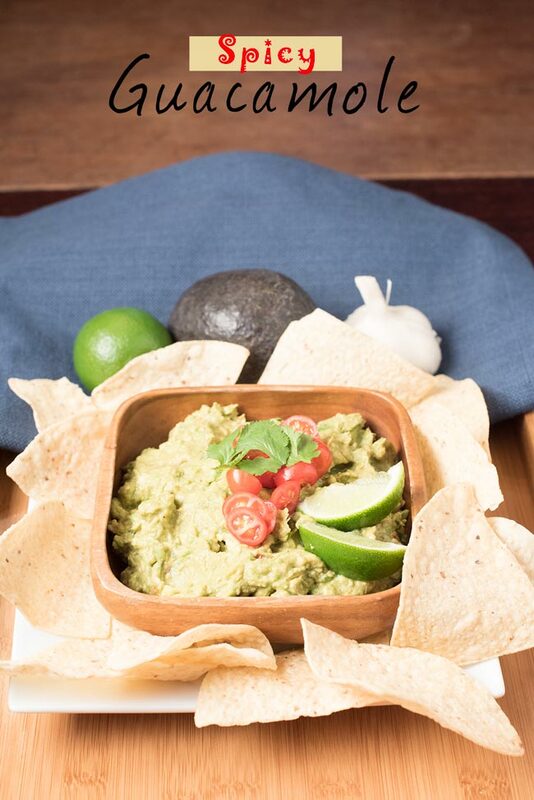 Can’t wait to make this for our next Taco Tuesday night!